IRVINE, California, September 23, 2015 (ENS) – West Greenland’s fjords are much deeper than early models showed, and hidden there, warm ocean water is undercutting the island’s glacier faces, raising sea levels faster than previously estimated, glaciologists have found. A research team led by University of California, Irvine glaciologist Eric Rignot battled rough waters and an onslaught of icebergs for three summers to map the remote channels for the first time. Their results have been accepted for publication in the journal “Geophysical Research Letters” and are now available online. “Measurements are challenging to obtain beneath hundreds of meters of seawater in poorly charted, ice-infested fjords,” writes Rignot, who also works with NASA’s Jet Propulsion Laboratory in Pasedena, California. He and co-authors Ian Fenty of JPL, Cilan Cai and Yun Xu of UCI, and Chris Kemp of TerraSond Ltd. obtained and analyzed around-the-clock measurements of the marine waters and their intersection with the coastal edge of Greenland’s ice sheet. To document the critical intersection where ocean hits glacier, Rignot used a half-million dollar multi-beam sonar device that bounces sound off the seabed. The scientists discovered that some of Greenland’s glaciers are perched on giant earthen sills, protecting them from the punishing salt water for now. But others are being eroded out of sight beneath the surface – they could collapse and melt much sooner than expected. Rignot’s team found that Greenland’s glaciers flowing into the ocean are grounded deeper below sea level than previously measured. This means that the deeper, warmer ocean currents can erode the glacier faces. “The real ocean heat is at a depth of 350-400 meters and below. This warm, salty water is of subtropical origin and melts the ice much more rapidly,” he said. “Numerical ice sheet models do not take into account these interactions and, as a result, underestimate how fast the glaciers will respond to climate warming,” Rignot said. More than 90 percent of Earth’s freshwater ice is held in the massive ice sheets and glaciers of the Antarctic and Greenland. As planetary temperatures climb, melt waters from these vast stores of ice add to rising sea levels. 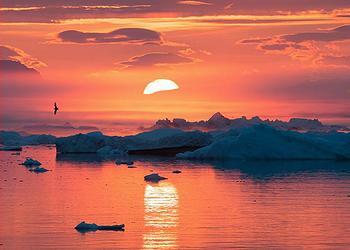 Greenland alone could raise sea levels by seven meters (23 feet) if all its ice melted. Next, Rignot will be working on a new NASA-funded five-year project called OMG – Ocean Melting Greenland. The team will head to the four corners of Greenland by ship and by plane. 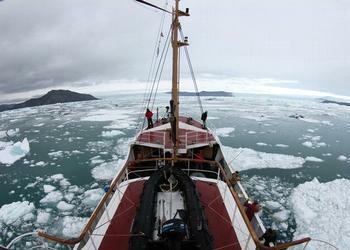 To see video, photos and a narrative of the August 2014 expedition, visit http://news.uci.edu/greenland.